Get that dressed up look with a lounge day feel. 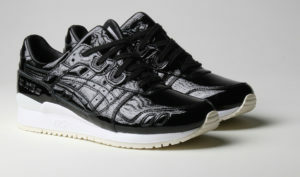 The ultra comfortable Gel Lyte III looks sharp with a patent leather upper on a clean white midsole. Topped off with a cream sole and embossed branding, these kicks stand out and stand up to a formal event.